Thanks to measurements by ESA's Cluster mission, a team of European scientists have identified 'micro' -vortices in Earth's magnetosphere. On 9 March 2002, the four Cluster satellites, flying in tetrahedral formation at 100 kilometres distance from each other, were crossing the northern magnetic cusp when they made their discovery. Magnetic cusps are the regions over the magnetic poles where the magnetic field lines surrounding Earth form a magnetic funnel. 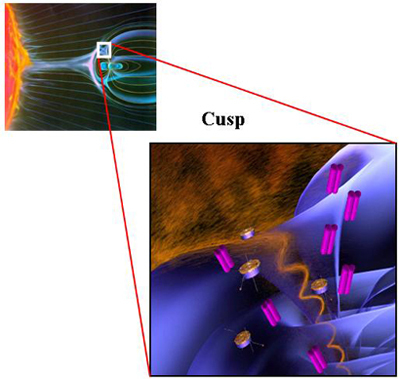 An illustration depiciting the spacecraft formation (in close-up) and the loction of the disturbance in the northern magnetic cusp. The magnetic cusps are the two important regions in Earth’s magnetosphere where the solar wind - a constant flow of charged particles generated by the Sun that crosses the whole Solar System - can directly access the upper layer of Earth’s atmosphere (the ionosphere). Large amounts of plasma (a gas of charged particles) and energy are transported through these and other accessible regions, to penetrate the magnetosphere - Earth’s natural protective shield. Only less than one percent of all the energy carried by the solar wind and hitting the Earth’s magnetosphere actually manages to sneak through, but it still can have a significant impact on earthly systems, like telecommunication networks and power lines. The turbulence exists at different scales, from few thousand to few kilometres across. With in situ multi-point measurements, the four Cluster satellites reported in the year 2004 the existence of large scale turbulence - vortices up to 40 000 kilometres wide, at the flank of the magnetopause. The new discovery of micro turbulence, with vortices of only 100 kilometres across, is a first in the study of the plasma surrounding Earth. For the full release visit the ESA Portal.